Myth: Free market economists firmly believe in allowing market forces to take their natural course without interference especially by government. Fact: When one of the biggest hedge funds (which bet on currency or market trends) got defoliated by the world economic crisis this September, the Federal Reserve pressured top bankers to come up with $3.65 billion to keep the fund afloat. Myth: The space program provides valuable data for Earth's inhabitants and probes the heavens to expand future horizons for humankind. Fact: First and foremost, NASA furthers military programs shrouded in secrecy. Copious space hype serves to further distract public attention from collosal expenditures on questionable and dangerous projects. Special Section: "Who Did You Vote for, Mommy?" Faircloth Gets Nailed as "Senator for Sale"
Low Voter Turnout Dooms Kinnaird and Lee? Fair Pay, Fair Conditions for Decent Work! Who Knows the Fate of the Congo? Myth: The world community supported the US airstrikes against terrorist sites in Afghanistan and Sudan. Its rough walls are still scarred by bullet holes from the shooting that began here as the community was gathered in prayer. EPA Helps Polluting Businesses, Not Activists - EPA employees view community activists as competitors. 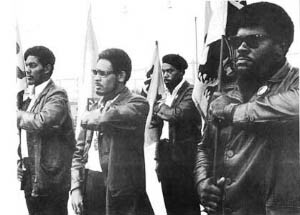 The Black Panthers Party, pictured above, laid a foundation for the black radical movement.. See story. Got to tell a story? Want to get someone's attention? We're out front and leading (ask the other alternative media!) Put your word out with the leader -- The Prism. Call (919) 968-3154. The Prism still needs a special semi-heroic someone to do a series of distribution tasks over a 6-month period. You set your own schedule. Work at your own pace. You get $500. And you get that deep, dyed-in-the-wool activist's satisfaction that all us regular Prism volunteers get. Call 968-3154 for more information. Why Volunteer with The Prism? Here are a few stories from people who have done it and lived to tell the story. Maybe next time, your story could be here. So, what are you doin' this summer? Why not volunteer with The Prism?? Call (919) 968-3154. "Health care is an essential safeguard of human life and dignity, and there is an obligation for society to ensure that every person be able to realize this right." Internationalist Books is solely responsible for the material in this section. o Movie Magazines and "Oscar Antidotes"
o Think the Nuke Dump is DEAD? o Do You Drive on These Roads? o What's "low level" about this waste? This month we have an entire section written by local union members and labor organizers in celebration of May Day, starting with the article by Sheila Payne on Strawberry workers. The holiday honors the struggles of workers to change the world (and especially those who fought and died for an 8-hour workday). Look what people are doing to improve the lives of workers and communities:. o Paul Ortíz writes that a vote for Wendy's fast food at Duke University displaces unionized workersand that Students for Justice at Duke launched a defense of the Dining Service Workers. o Joe Bowser of Durham didn't want to join a union but after he did, he decided it was good for him and for the women and men he worked with. o A UNC-Chapel Hill labor forum highlighted how globalization affects local workers, as reported by the Four Fronts!!!! newsletter. o Pete Castelli of UNITE! tells how unions work to benefit all workers, not just members: a Greensboro "Livable Wage" campaign to lift workers above poverty wages. o And Malcolm Goff shows how the efforts of UNC system housekeepers to unionize highlights the special need to organize in the Southeastern US. o Why don't we have modern schools? o Our Community is the "Sacrificial Lamb"
Candy is Dandy . . . But in Cigarettes? Just look! The Prism is going to the Dogs! Meet "Miles," our new volunteer who attends editorial and production sessions. He was recently dubbed "Most Valuable Prism Volunteer" for his qualities of loyalty and eagerness to please. He turned down the Prism Distribution Job saying "Aw, that job is for the (other) dogs." If you think your two hands could do better than Miles four paws, call us today! Can You Spare Some Social Change? Myth: The most blatant Middle Eastern violator of UN Security Council resolutions is Iraq. Fact: The Middle Eastern nation that has defied 69 UN Security resolutions, and alone has nuclear weapons, is Israel. Lessons in Democracy for US Military "School"
Debate Raises Deeper Questions re "Sections"
All Out for the 16th Annual Martin Luther King Day March and Rally!